Did you know that your blood pressure will actually go down by looking at the colour blue?! It’s true, and that’s why it’s such a fabulous colour to use in a bedroom, like the one I designed above. Use the most calming colours you can, like white, gray, pale green. And create a little oasis by adding flowers, books, and maybe even a candle to the bedside table. Whatever makes you feel happy and relaxed! When interior designers like me use this term, we’re talking about having a lot of light sources in a room, from bright to quiet. 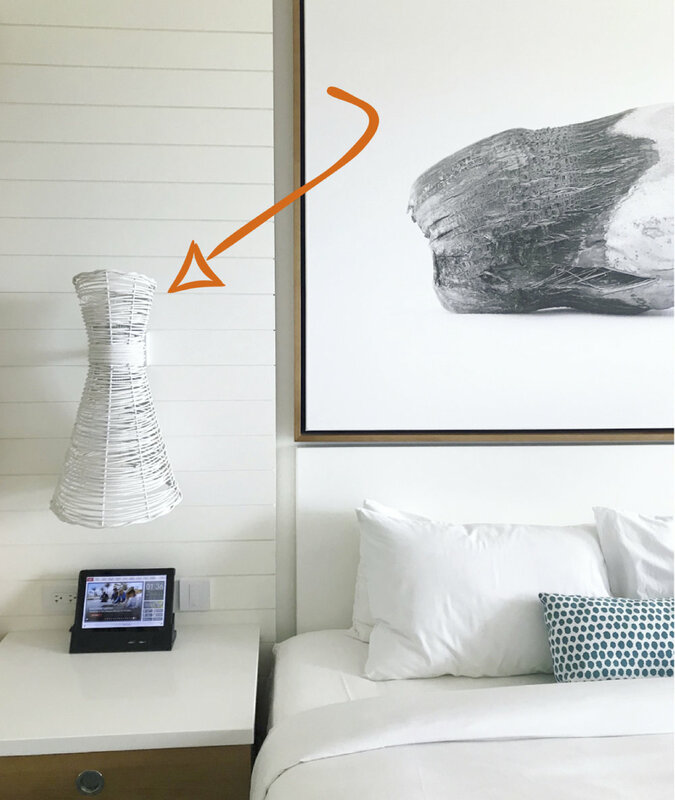 Bedside lights – like this amazing sconce I saw in a hotel in the Bahamas – give you just enough light to read, but not enough to make the room too bright. 3. Invest in the Best. There are 2 things that are so important to invest in when it comes to a bedroom: your mattress and your linens. You will spend one-third of your entire life in bed, so you’d better be comfortable while you’re there! How the mattress feels is entirely up to your body type and your sleeping style, so be sure you test-drive as many as you can in the store. And get the linens that feel the way you want them to! For example, if you get too warm when you sleep, then be sure you go for natural fibers like bamboo, silk, and cotton to keep you cool. Most everyone sleeps better if you can block a lot of the light in the room. I like to use light-blocking draperies floor to ceiling to really get the room as dark as possible in the evenings. Try these tips to create welcoming rooms for your guests, and to help you create a quiet respite from your stressful day!